Surfrider Ventura’s Plastic Free Ventura campaign launched on Earth Day in 2018 as a response to the amount of plastic litter that volunteers are picking up a local beach cleanups. Some of the common items collected include straws, expanded polystyrene foam (aka Styrofoam) and plastic cups. Scientists estimate that by 2050 there will be more plastic than fish in the ocean by volume – unless we act now! Strawless Challenge is a campaign activity to encourage restaurants to use less plastic with a simple ask: provide straws only upon request! How many times have you gone to a restaurant and received a straw without asking for one? 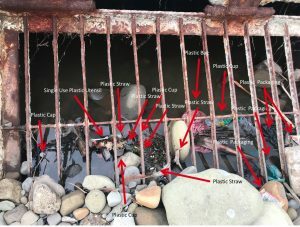 Straws are often littered, or caught by the wind, and washed into storm drains that empty into streams, bays, and other waterways, and otherwise end up in our ocean and beaches. Plastic straws are frequently cited as one of the top ten contributors to marine debris pollution. Plastic does not biodegrade, but instead, photodegrades into smaller pieces of plastic causing pollution that is virtually impossible to remediate. When plastic enters our waterways, it adsorbs toxic chemicals such as DDT, PCBs, PAHs, and flame retardants that can be found in our waterways. In addition to Strawless Challenge, the Plastics Free Beaches campaign aims to convince Ventura City Council to pass a plastics reduction ordinance to help address the issue. There are over 115 places in California that have local legislation aimed at reducing plastic litter and Ventura should be next! This photo of a Ventura storm drain earlier this year shows the need for why we need to act now on the issue. 1- Getting more postcards signed! Right now, getting more postcards signed is a tactic everyone can help with so keep it up. We will be placing another order soon so there will be plenty if you would like more. 2- Analyze other local plastic reduction ordinances in California to help identify a city similar demographics to Ventura with a successful ordinance that can be a case study for City Council to review. 3- Analyze local beach cleanup data to highlight the straws, foam etc. we have collected over the years to create info graphs, etc. 4- Research restaurants in Ventura to identify small restaurants with high to-go volume that do not use styrofoam and could be used as case studies for City Council. 5- Help lead our monthly beach cleanups at Surfers’ Point. Click Here for more info. # Stats provided on straws are from Surfrider’s Plastic Straw Toolkit for Activists that is accessible here.